Is there any possible to download and convert Spotify music to MP3? No matter you are a premium user or a free user, you can not download Spotify music on MP3 format directly. You just need a third-party tool to help you. There are so many online or desktop Spotify downloader in the market, which one that you can rely on? Here we will show you some Spotify to MP3 solutions and briefly tell how these services work to download MP3 songs from Spotify, then you can choose the one you need. MP3FY supports over 1000 Websites. Starting from Youtube, Facebook, Instagram, Vimeo ... to BBC, CNN. It also supports to convert Spotify to MP3. However, right now only single tracks are supported. To use it, an account is required, both premium and free account will work. Step 1 Open the website: https://mp3fy.com/. Copy and paste the url of the Spotify song to the search box and hit the Enter key. Step 2 A new window will pop up. Click the Download button, then you can get the MP3 song. This free online converter can help you to convert playlists from different services and music formats like Spotify, Deezer, Youtube etc.. But, it only supports to convert playlist. You should create a playlist first and add all songs you want to convert to the new playlist. Step 1 Open the website: http://www.playlist-converter.net/. 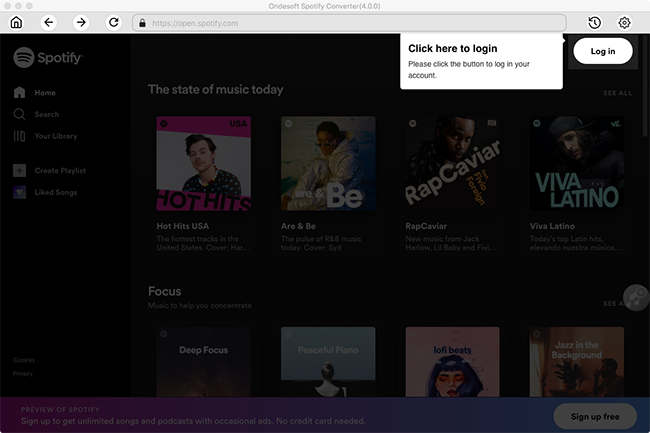 Click Spotify logo button, and login with your Spotify account. Step 2 Choose a Spotify playlist that you want to convert, then it will load the playlist from your account. Click the Download button to get the converted songs. It allows you to convert Spotify songs to MP3 faster and easier. You can enter the url of the Spotify song, then the song will appear on the website. Step 1 Open https://audio.online-convert.com/convert-to-mp3. Enter the url and click the Add URL button. Step 2 It will load the song soon, you can change the output settings, then click the Start conversion button. Spotiload is a Chrome extension that allows you to download in mp3 format Spotify playlists. Spotiload uses vk.com social network to search and download tracks with matching name from any Spotify playlist. You can download it from extension on Chrome. But it requires vk.com account. Ensure that is is not block in your country. convert2mp3.net allows you to convert and download your favourite videos from YouTube, Dailymotion and Clipfish in a format like MP3, MP4 and convert Spotify music to MP3, MP4 and more formats. Step 1 Open http://convert2mp3.net/en/. Copy and paste the url of the Spotify song to the search box, and select MP3 as the output format. 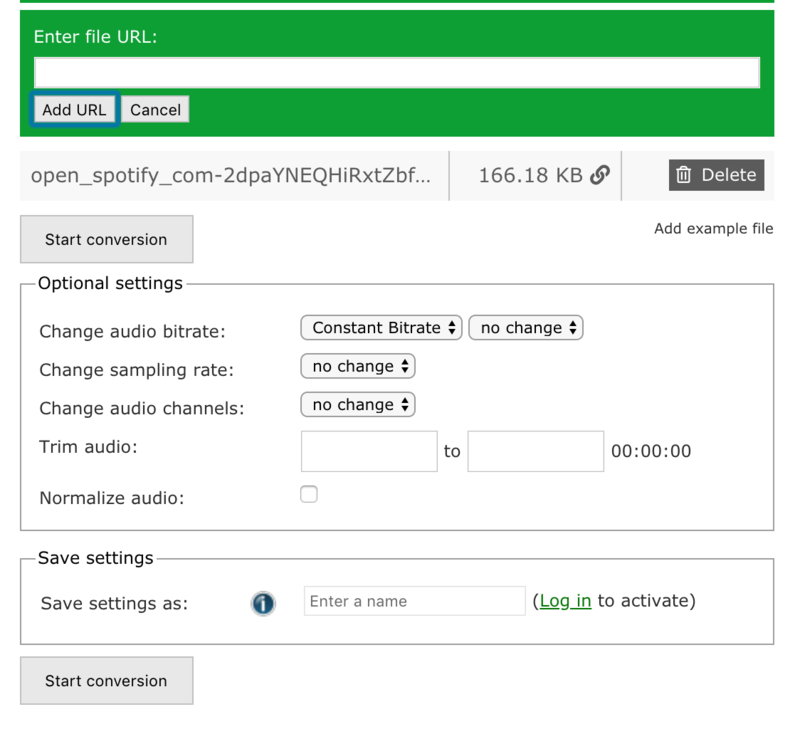 Step 2 Click the Convert button to download the Spotify song in MP3 format. Pros: Some of them also supports to convert video and songs from other websites. Support multiple output formats. Free online service and easy to use. Cons: Not record the songs from Spotify but find other sources to replace. And it has some trouble when downloading songs that have multiple artists. Downloads some random or wrong tracks sometimes, and some of them takes too long time to response when clicking download. It is hard to preserve the original audio quality and ID3 tags. Although these online services are free, there are so many limitations. If you pay more attention on high audio quality, ID tags, metadata information, technical support and regular updates. We recommend a well-known standalone Spotify to MP3 downloader and converter. 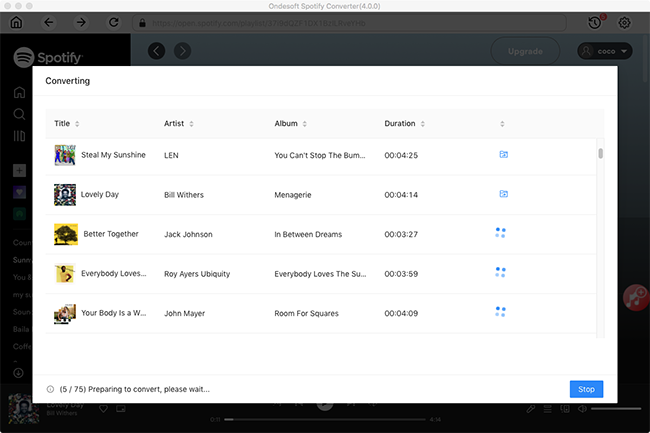 It is Ondesoft Spotify Converter, works on both Windows and Mac. It is a smart Spotify DRM removal tool specialized in downloading and converting any Spotify music, including Spotify tracks, playlists and albums to common MP3, AAC, WAV, FLAC, M4A, M4B format. Built in advanced encoding technology, it is able to keep original quality and all ID tags, such as artist, track number, year, genre, composer, etc. 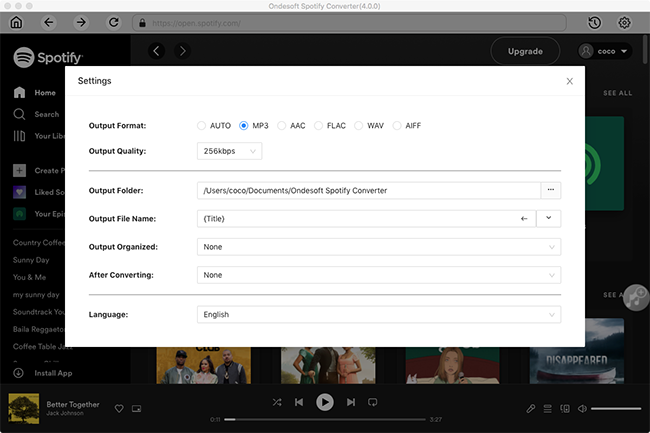 How does Ondesoft Spotify Converter work to download Spotify to MP3? 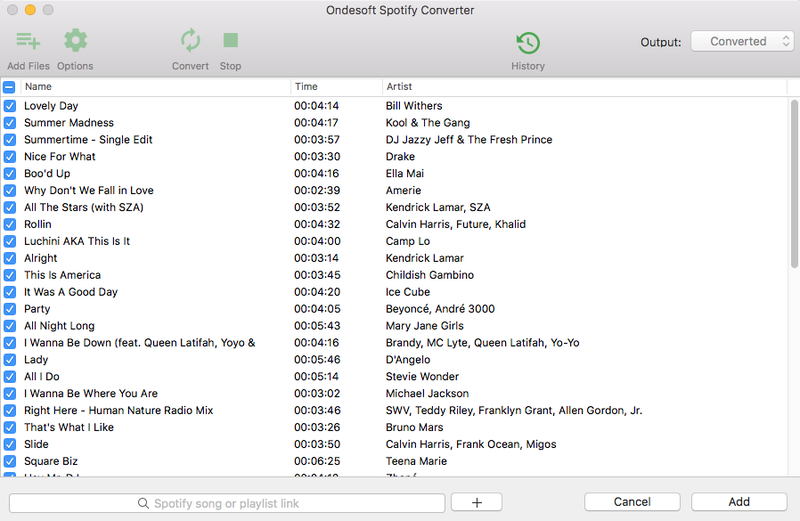 Download and install Ondesoft Spotify Converter on your Mac or Windows. Before you run it, please make sure that you have installed the latest Spotify on your computer. 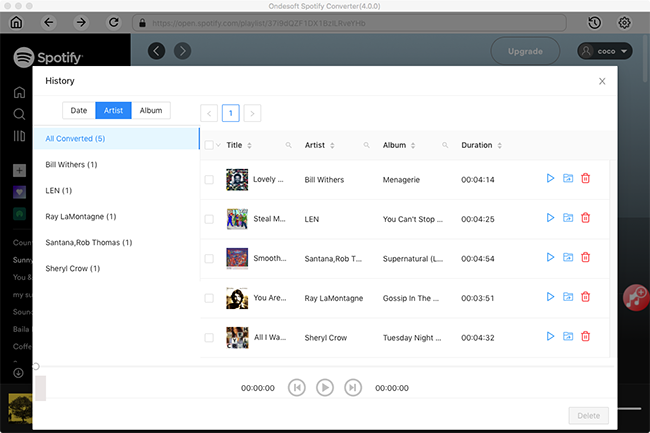 Then launch Ondesoft Spotify Converter, Spotify will be launched automatically. 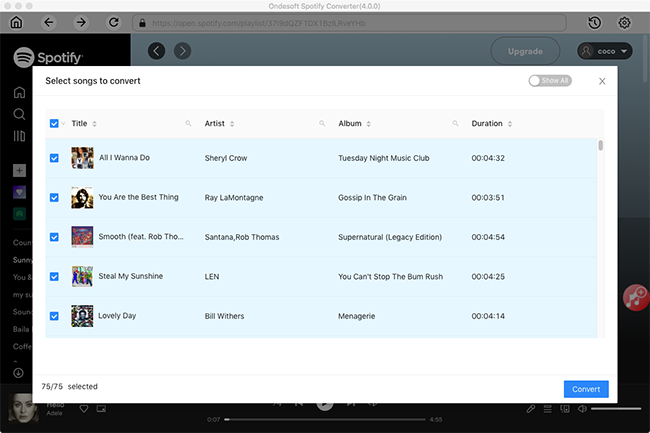 Find the songs you want to convert, then drag the song, album or playlist to the main interface of Ondesoft Spotify Converter. Or you can click the Add Files button, copy and paste the url of the song to the search box on the bottom of the program. Click the Add button, then songs will be added to the conversion list. All songs in the playlist or albums will be checked by default. You are free to uncheck the tracks you don't want to convert. Then click Add to import all checked songs. Click the Options button, you will find the song artwork, title, artist, duration and output format on the pop up small window. The default download format is mp3. It also supports downloading Spotify Music as M4A, WAV, FLAC. You can also change bitrate, samplerate according to your needs. Click the Convert button to start downloading and converting songs. Wait for a few minutes, you can find all converted songs by clicking the History button. After conversion, click below folder icon to quickly locate the DRM-free Spotify songs, albums or playlists in MP3 format. You can then transfer and play them anywhere such as iTunes , Google Play Music , iPod , Sandisk , etc. or burn them to CD .